Where I’m from, Spring began today. Where I live, it won’t start until March 20. In the Celtic calendar, February 1 is known as ‘imbolc’. The midpoint between the winter solstice and the spring equinox, it’s seen as the first day of the earth awakening from winter. 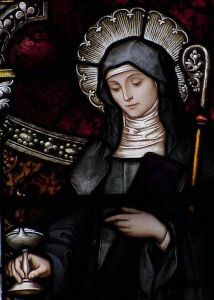 In Ireland it was, and is, Saint Brigid’s Day, a celebration of the pagan (later Christianized) St Brigid of Kildare, a patroness of medicine, arts and crafts, cattle and other livestock, and sacred wells. The sacred bit is important. As a schoolkid in Ireland, we’d make St Brigid’s Crosses from reeds – a plentiful resource in my then-hometown of Athlone, on the banks of Ireland’s longest river. The crosses would be pinned up at home – a religious talisman of sorts, ahead of the spring season. Today I’m a long way from the River Shannon, or from spring – that won’t happen until late March in Oregon. But, after the dreary month of January, I’m trying to get in the spring mood. So I’m seeking out seasonal verse. St Brigid was known as “the goddess who poets adored”, but I’m not aware of Philip Larkin’s thoughts about her. However I do know – and enjoy – his take on spring, which contains the wise call, despite some cynicism, to “begin afresh, afresh, afresh”. Tagged Cormac Looney, February 1, imbolc, Ireland, Philip Larkin, Poetry, spring, St Brigid, St Brigid's Cross, The Trees, U.S.
That was the question buzzing around among my music-listening peers in December 1997. Former Pogues singer Shane MacGowan had cancelled a pre-Christmas show with his then-band The Popes at the Olympia. Days shy of his 40th birthday, it was rumored that the songwriter had collapsed, or was gravely ill, or on bender of some sort. Whatever the reason for the no-show, the consensus was that the Tipperary man had been lucky to make it this far, given his voluminous consumption of drugs and alcohol. Twenty years later MacGowan is still around. What’s more, he’s still performing – albeit in a short bursts. He took to the stage at the National Concert Hall in Dublin last Sunday night, closing out a show staged in his honor. MacGowan sang ‘Summer In Siam’ with Nick Cave and then performed a version of ‘Wild Mountain Thyme’, rounding out a night which saw performances from the great, the good, and the ‘well, maybes’ of Irish and international music. It sounded like a good evening, albeit one far removed from the merry, beer-stained chaos of any Pogues show I’ve attended – then again, it’s a long way from the Pindar of Wakefield to Earlsfort Terrace. Plenty of classic Pogues’ songs got an airing, of course, including that Christmas one. But one composition that didn’t – as far as I know – was a song MacGowan wrote but never himself recorded. ‘The Dunes’ is a song of horror, a Famine survivor’s account of the burial of bodies in the sand dunes of a Co Mayo beach. Children play among the grave mounds, the bones of the dead are revealed, and grieving relatives pray. Forms of the dead rise and dance on the sand. The singer, enraged by the deaths, shoots a bailiff and a landlord. He blames them for stealing food from the dying. As verse, it has a simple, arresting cadence. To hear it performed – or declaimed – by Ronnie Drew is a whole different experience. Shane MacGowan wrote a number of songs that will go down in the canon, but none of them are tragic, as angry and as chilling, as ‘The Dunes’. I can think of few others who could have written it – which is probably what makes MacGowan unique. Now, is it too late for him to record it? One hundred and fifty five years ago today a poorly equipped Mexican army defeated Napolean III’s French troops at the Battle of Puebla. The victory, part of the Franco-Mexican War, was more symbolic than actual. A year later a French force of 30,000 defeated the Mexican army, captured Mexico City, and set up the short-lived Second Mexican Empire. The symbolism persisted, though, as Mexicans celebrated Cinco de Mayo (‘Fifth of May’), casting the French defeat as a symbol of Mexican national unity and pride. All this goes some way to explaining why many people in Mexico’s largest neighbor will spend today eating tacos, drinking tequila, and wearing questionable sombreros. Cinco de Mayo may be a big deal in Mexico, but across the border it’s a wider, and widely observed, celebration of Mexican-American culture. It’s mostly news to me, of course. I’d been educated on the day by my wife, who grew up in Los Angeles, but I didn’t realize its all-pervasive sweep until I relocated to the States. Thoughts of Mexico, and food, and the U.S., today bring me back to the first time I visited the country. Back in the 1990s I travelled to San Francisco for a short visit, staying with friends. My lodgings were in the Mission District, and my staple meal was the burrito. Not just any burrito, mind you. Without knowing its legendary reputation, my friends and I ate daily at La Tacqueria, at Mission and 25th. The burrito was my one decent meal a day – loaded with rice, refried beans, and meat, and accompanied by a bag of chips, it covered most of the food groups I needed. A steaming, satisfying, beef-laden madeleine, it was so good that I returned with my wife, on a visit to San Francisco years later, to sample it again. I’m closer to La Tacqueria than previously nowadays, but I’m still a 90-minute flight from that burrito. I also live in a town that offers not just burritos, but burritos and beyond. And so, this Cinco de Mayo, I’ll be doing the (to many) unthinkable – celebrating with a sushirrito. It may be a fad, a ‘mutant food‘, or something that irks the purists, but believe me it tastes good. Well, the one at Teppanyaki Hut on Portland’s Mississippi Avenue does. So, feliz Cinco de Mayo. Or, itadakimasu! It’s 31 years since Route 66 – the blacktop mythologized by John Steinbeck as ‘the mother road’ – was decommissioned. The highway disappeared from maps but not, of course, from popular culture. The likes of John Steinbeck – who put his fictional Joad family on the road in The Grapes of Wrath – and Nat King Cole – whose (Get Your Kicks On) Route 66 became a rhythm and blues standard – took care of that, long before the last road sign was taken down in 1985. The highway, established in 1926, ran almost 4,000km west from Chicago to Los Angeles. What started as a route for trucks became a path to a 20th century manifest destiny – the road to a place in the sun, in the golden groves of California. It entered the American consciousness during the Dust Bowl migrations of the 1930s, when thousands of families from Oklahoma and Texas drove or hiked west seeking work. Route 66’s mythology was sealed in those years – a byword for migration, freedom, escape and the loneliness of a vast country. During the Second World War it became a key route for transporting munitions to the ports of the west coast. The road fell to leisure use in the 1950s – a convenient route to California that ran close to the Grand Canyon and across the vast southwestern desert. By the time I came upon Route 66 – almost 20 years ago – it had ceased to exist. I encountered it by accident. Driving across the US in 1999 my travelling companions and I stopped in Williams, Arizona, a small town on I-40, the interstate which replaced Route 66. We only discovered when we parked up that we were doing so on side of the famed highway itself. Steinbeck’s “long concrete path across the country…the road of flight” was quiet that day, hosting the sporadic lunchtime traffic of a small southwestern town. The ghost of Tom Joad had long since moved on. As all of us do. Next month I will set out on a Route 66 of my own, departing Ireland for the Pacific North West. While packing possessions this week I came across a photo I took in Williams on that day in August 1999. A fitting sign, as I step back onto the Mother Road. La Serenissima was already sinking when Byron wrote his famous verses about the city more than 200 years ago. Nowadays the city is subsiding into the surrounding lagoon at the rate of 2mm a year. Not that it matters to most of us. The waves could be lapping at the altar of St Mark’s Basilica and it would still be crowded with visitors. I suspect that even in the depths of winter, amid fog, rain and blasts from the bora, the sidestreets around the Piazza San Marco and the market stalls of the Rialto are still full of sightseers. But that’s no reason not to go, and so I found myself standing on the Viale Giardini Pubblici last week, as the April sun sank behind the Salute and the last light of day fell across the Grand Canal and onto the Riva degli Schiavoni. The great landmarks of Venice – San Marco, the Canal, the Salute – are well known and well populated. But there’s another Venice to the one trodden by cruise-ship groups and tired families, of course. Here’s five ways to experience Venice that mix up the well-known with the less visited. This simple decor of this small room, where Giuseppe Cipriani opened a bar in a former rope warehouse 85 years ago, belies its reputation as one of the world’s most famous watering holes. The home of the carpaccio, the bellini and the ghost of Ernest Hemingway, it serves a fine Old Fashioned whiskey cocktail with a ‘doppio’ measure – Papa would hardly approve of anything less. After stints in London and Paris the bohemian art collector Guggenheim settled in Venice in 1949, setting up residence in a 18th century palazzo on the Grand Canal, which housed her collection of Cubist, Surrealist, Futurist and Abstract Expressionist paintings. Her house now serves as a gallery for the paintings. The view above is from her living room, through a window nestled between a couple of Kandinskys. “A wide brackish waste surrounds it, exuding dankness…it is a muted scene…but in the middle of it there bursts a sudden splurge of rather childish colour…this is Burano”. So wrote Jan Morris of this small island, home in its heyday to fishermen and lacemakers. Forty-five minutes across the lagoon from Venice, it’s a million miles away in spirit. Small, house-proud, well-swept and very well-painted, Burano is a reminder that the people of the Venetian lagoon were – before the yachts, celebs and royalty – ordinary seafarers and merchants. This bookstore has a novel (sorry) way of keeping its stock dry from flooding – sticking the titles into gondolas. That’s not the only gimmick in this chaotically-shelved shop – a series of steps in the backyard are made of old encyclopedias, while canoes and other odd vessels can be found crammed with paperbacks. We rented an apartment for our stay in the quiet Castello district, near to the Giardini Pubblici, the gardens created by Napolean Bonaparte when he took control of the city in the early 19th century. The quayside fronting the Giardini is remarkably quiet, used mainly by local strollers and joggers, yet affords beautiful views west along the Grand Canal, taking in the Salute, the Campanile di San Marco and the Doge’s Palace. ‘States fall, arts fade – but Nature doth not die’…anyone for an aperitif at the Danieli? Assuming that cars and foodmarts haven’t gone the way of the Medicis by then. 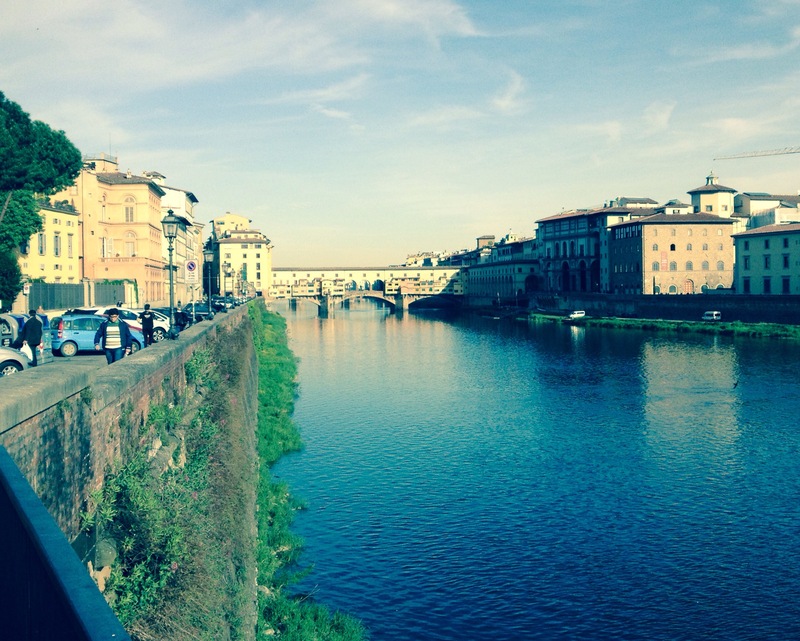 Above the Arno and the moving city on this April morning. Who’s just asked the wrong question. And Florence alive above her” . FOR the past four months I’ve heard voices. Some scared, some hopeful, some excited and some disillusioned. They’ve been the voices of, for the most part, young men. Or the echoes of young men in the accounts of their older selves. I’ve encountered dozens of them in recent months as part of my work compiling The Herald’s 1916 ‘Rising Remembered’ coverage. Many of the voices are contained in the archives of Ireland’s Bureau of Military History (BMH) – fighters’ accounts of what they did and saw, who they shot and who died in front of them, in the Easter Rising. Other information came from family members. The statements given by these rank-and-file Irish Volunteers provides a street-level account of the events of Easter Week that parallels the grand narrative, which usually focuses on actions of the leaders, their last stand and subsequent executions. 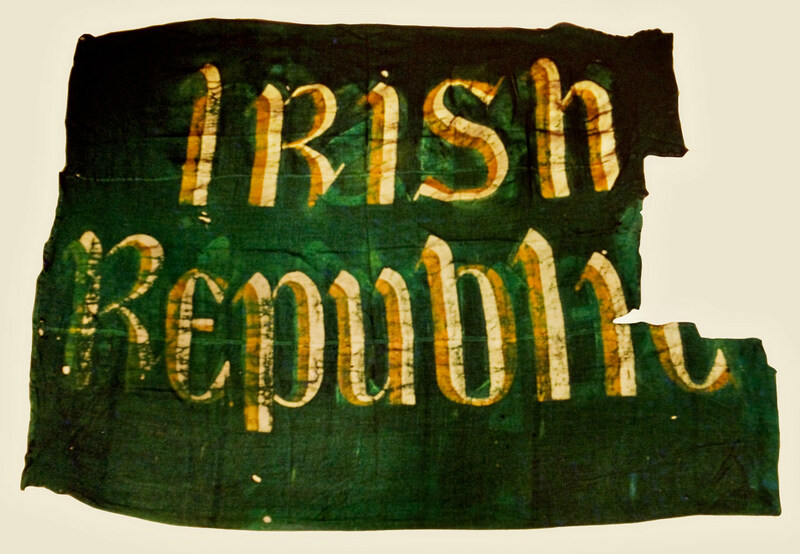 While some Volunteers – like Harry Walpole, who raised the ‘Irish Republic’ flag at the GPO – were present at key moments, others fought out their Rising on the sniper-ridden sidestreets of Dublin. Annie Grange, for one, performed first aid and came under fire at City Hall. Mamie Stephenson ferried concealed weapons between safehouses and rebel outposts. Some survived despite being injured – like Leo Casey, who sustained eye damage in a firefight in the Grand Canal Street area. Others did not. John Dwan, whose brother was in the British Army, was shot by British troops on the last day of the Rising at North King Street – his friend pulled him from a barricade but he died of his injuries shortly afterwards. Richard O’Carroll was shot in the chest by a rogue British officer after being captured at Camden Street, and passed away nine days later. His death was recorded as murder. Statements given to the BMH by those who survived give an indication of the confusion and violence that marked Dublin’s streets that week, 100 years ago. Joseph Dolan, who took part in the occupation of the South Dublin Union hospital recalled: “The nuns enquired from me if we’d come to read the gas meters”. Helena Molony, who fought at City Hall stated: “The women had no uniform…I had an Irish tweed costume, with a Sam Browne [belt]. I had my own revolver and ammunition”. Robert Holland, an insurgent in the Marrowbone Lane area, told how: “She was only about 35 or 40 yards away from me and I fired on her. She sagged halfway out of the window. The hat and the small little shawl fell off her and I saw what I took to be a woman was a man in his shirtsleeves”. The accounts of desperate, dangerous and often grubby streetfighting – punctuated by constant sniper fire, prayer sessions and boredom – are some way from the story of noble sacrifice that was taught to generations of Irish schoolchildren, or the Government’s politically correct, watered-down Rising. They are worth reading though – if only to remind us of the full story behind the birth of a nation. On the morning of April 27, 1916 John Cardiff – my grandfather – was one of a group of Irish rebels who mobilised in Enniscorthy, Co Wexford. A member of nationalist youth organisation Na Fianna Eireann, he was 13 years of age. In the hours that followed the group took control of their hometown – which they held for four days – as part of an uprising against British rule. “The town hall was seized and used as headquarters, outposts were placed throughout the town and sporadic firing occurred. A detachment of Volunteers kept the RIC [police] barracks in Abbey Square under fire from the turret rocks across the [river] Slaney,” Volunteer Thomas Dwyer recalled. Enniscorthy was the only urban area outside of Dublin to be seized during the Rising. From the Thursday of Easter week to the following Monday it remained under the control of rebels (commanded by Capt Robert Brennan), until the surrender order given by Rising’s commander-in-chief Padraig Pearse was confirmed. 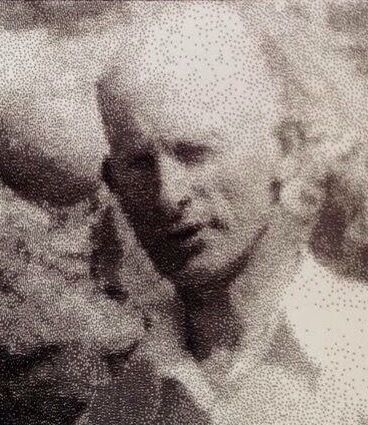 John Cardiff didn’t leave a public record of his activity during the Rising, having died a decade before the Bureau of Military History took statements from its ageing participants, in the late 1950s. It is known that he was one of 35 teenagers who drilled at the Irish Volunteers headquarters at Mary Street in the town in the year preceding the Rising, as a member of Na Fianna. At this time he, along with others, covertly monitored Royal Irish Constabulary (RIC) movements in the town. During the four-day Rising it’s likely he carried dispatches between units of the older Volunteers, as a number of Na Fianna members did. After the Rising he was not arrested – probably on account of his young age – and likely worked with others to collect and conceal weapons that were abandoned by the Volunteers after the surrender. Cardiff remained active in Na Fianna in the years from 1917 onwards, as a section commander, maintaining firearms and ammunition and drilling. It’s recorded that in 1920 he was Intelligence Officer for Na Fianna in the town, during the War of Independence. His comrade Thomas Dwyer recalls that Cardiff was the co-leader of a group of 25 who raided on a merchant’s store in Enniscorthy that year to search for arms. This was one of a number of raids for arms spearheaded by Cardiff in his role as Intelligence Officer. But no full account of his revolutionary activities exists, to my knowledge. 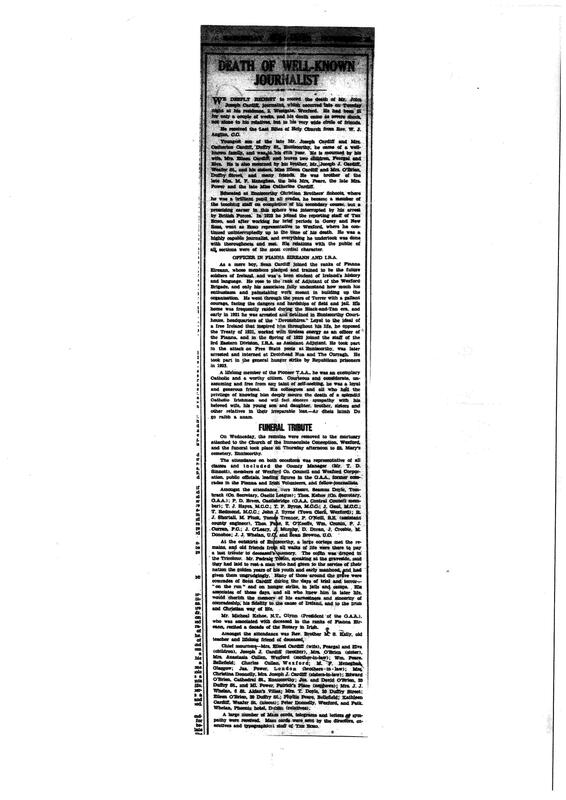 Like many of his generation all that exists – on the public record at least – is a number of mentions of his name in the statement of a fellow Volunteer (in this case Thomas Dwyer), and a brief account in his 1950 obituary (below). The latter, published in the Wexford Echo, states: “As a mere boy Sean Cardiff joined the ranks of Fianna Eireann…He was a keen student of Ireland’s history and language. He rose to the rank of Adjutant of the Wexford Brigade, and only his associates fully understand how much his enthusiasm and painstaking work meant in building up the organisation”. John Cardiff’s rebel story didn’t end in 1920. In 1921 he was arrested by the Devonshire Regiment of the British Army and was imprisoned for a period in Enniscorthy Courthouse. He joined the IRA in 1922 at the rank of assistant adjutant. Opposing the Anglo-Irish Treaty, he took part on attacks on Free State posts in Enniscorthy during the Civil War. After a period ‘on the run’, he was arrested and imprisoned in Newbridge, Co Kildare and The Curragh. In 1923 he spent a period on hunger strike in prison. Cardiff’s 1921 arrest effectively ended his career as a schoolteacher. On release from prison in 1923 he became a journalist, eventually basing himself in Wexford town and working for the Echo newspaper. He married and had two children. John Cardiff died in November 1950, at the age of 47. He will be remembered, along with other participants of the Rising in Enniscorthy, at a State commemoration in the town on Easter Monday next. It was the dish that won the First World War. George Orwell argued that it staved off revolution in Britain the 1930s. It was one of the few offerings that escaped rationing in London’s Blitz. Yet fish and chips arrived in Ireland by accident – it’s reputed – when Italian immigrant Giuseppe Cervi stepped off a boat in Cork around 1880, mistaking Cobh for New York. Undeterred, Cervi walked to Dublin and wound up selling fish and chips from a handcart near Trinity College – the first person in Ireland to do so. He may have got the idea from fellow emigrants who’d passed through London, where the first fish and chip shop opened in 1860. Despite Cervi’s ingenuity it took 70 years for the dish to become a staple in Ireland. When it did, in the early 1950s, the advent of trawler fishing had reduced the cost of fresh fresh (finding potatoes was rarely a problem). The food carts of the nineteenth century were long gone at this point, replaced by the ‘chipper’ – the canteen-like aesthetic of which has remained standard to this day. Like most Irish people I grew up with the dish. The first time I had fish and chips they were likely bought from the long-departed Grace’s on Bride Street in Wexford (a place also renowned for that local staple, the rissole). In the intervening years I’ve had fish and chips on the terraces at the old St Mel’s Park soccer ground in Athlone, at MacCurtain Street in Cork after a long reporter shift, on ferries to Britain for summer holidays, and after nights out in my college days in Dublin. The offering remained unremarkably unchanged. Over the years the wrapping moved from yesterday’s newspaper to a generic paper sheet – but it was still handed over, soggy with vinegar and covered in salt, in a steaming brown paper bag. Then, about five years ago, fish and chips changed. Blame the Celtic Tiger, or April Bloomfield, or whoever designed those ludicrous small steel buckets, but fish and chips slowly started to appear on plates in restaurants. I now found myself eating it sitting down, at a table, instead of standing at the back of a packed chipper, or while dodging drunks on a street at 1am. Gone too was the stodgy yellow flour and water batter, replaced by a lighter beer variety. The chips were now cooked twice over, a time-consuming trick that no doubt had Guiseppe Cervi turning in his grave. And it was great. As others argued over Beshoff’s or Burdock’s I sat in L Mulligan Grocer or the old WJ Kavanagh and hailed the revolution, one serving at a time. Until a few weeks ago, when my father sent me a text message from Kilmore Quay, a small fishing village in the south east corner of Ireland, renowned for its seafood. ‘Come here for the fish and chips,’ he wrote, sending a picture of the meal as I remembered it – all angle-cut chips and heavy battered fish. And so, last week, I travelled the 100 or so miles to the Saltee Chipper in Kilmore Quay. My concession to civilised dining was opting to eat at a table there, swapping the brown bag for a plate. The haddock I had was caught and battered that morning. The steaming chips were just as fresh. Mushy peas – marrowfats ground into a thick green paste – were an added bonus. To top it off it there was a howling, rain-flinging gale outside – proper fish and chip-eating weather. There isn’t a moral to this fishy tale. I’ll still order the gourmet fish chips when I’m in the mood, and I’ll try to convince myself it tastes better. 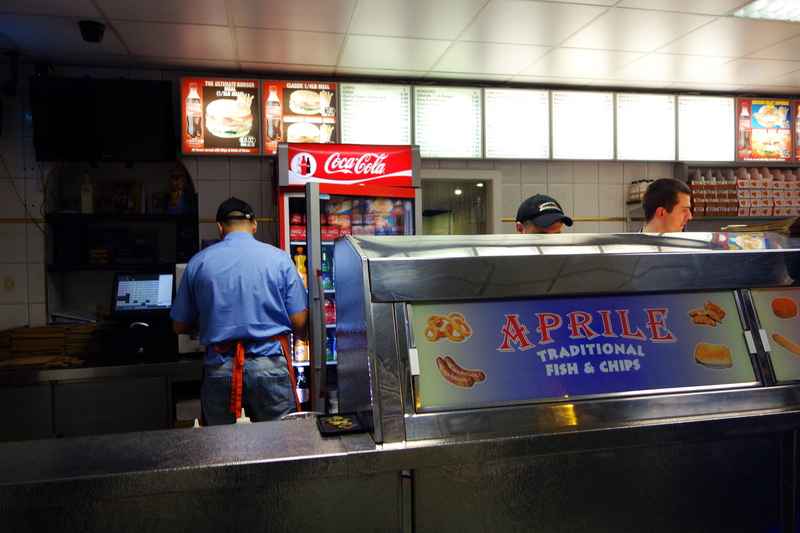 But last week, for the umpteenth time, I left my heart in an Irish chip shop. If one photograph sums up the complexity of modern Irish history, it’s this one. It was likely taken on Saturday April 29, 1916, the sixth and final day of the abortive Easter Rising in Dublin. In frame are British Army soldiers, who’ve erected a barricade at the junction of Moore Street and Great Britain Street (the present-day Parnell Street) in the north inner city. The soldiers are firing on a number of houses 200 metres down the street, where the leaders of the insurgency are making a last stand. Within hours of the photograph being taken a nurse and rebel, Elizabeth O’Farrell, would approach the barricade bearing a white flag, carrying terms of surrender. Not before casualties were inflicted however – among civilians and combatants. 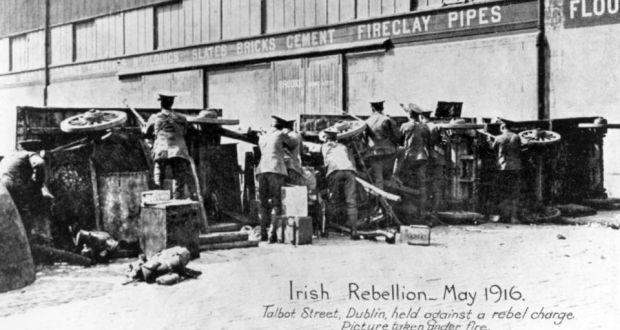 One rebel, James Kavanagh, later recalled: “The 18th Royal Irish…shot at everything that moved in the street, and at such short-range their shooting was deadly. I saw three men attempting to cross the street killed by three shots, 1, 2, 3, like that. It’s a wonder they did not shoot [a] little girl but they would surely have shot [her] mother”. The picture is one of a number of similar shots taken during Easter week, images of young men with rifles crouching behind cars, or debris, or beer barrels. What’s interesting about the Moore Street image is the nationality of the sniping solders. The troops facing and firing down Moore Street are members of the 18th Royal Irish Regiment. Most of the regiment were Dubliners, many of whom came from the tenements of the north inner city, close to where this picture was taken. So we see young Irishmen firing on young Irishmen, directed (to the right of the picture) by a British army officer. In this instance (and many others in Easter week) the combat was carried out by Irishmen on both sides – the rebels who believed they were taking a stand for freedom and the soldiers whose army paychecks fed large families struggling to survive in the Dublin tenements of the time. Irish history, like Oscar Wilde’s truth, is rarely pure and never simple. In the years following the Rising such divisions would persist. After Ireland achieved independence in 1921 the status of the Irishmen who fought with the British Army, and who died in their thousands in the First World War, fell far in the public estimation. In recent years this has changed but remembering these men – some of whom fought their neighbours on the burning streets of Dublin a century ago – remains controversial in places, even now. As Ireland moves in the coming weeks to commemorate those who planned and effected the Easter Rising, should the half-dozen soldiers firing down Moore Street – and the thousands of their countrymen in similar uniforms – be remembered too, for good or for ill?